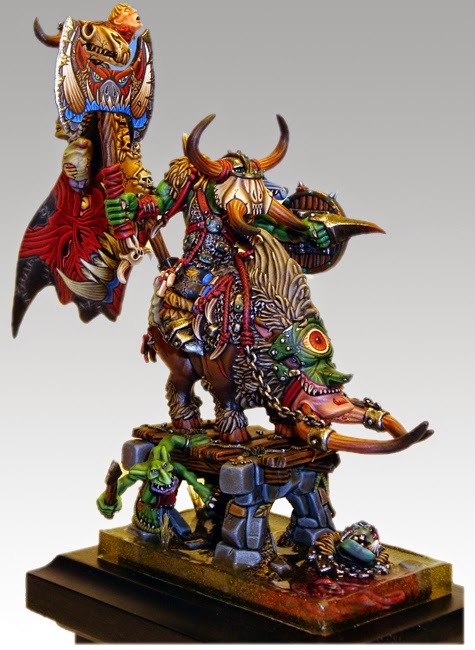 When I interviewed Todd Swanson the other week for the Miniature Painting Masters series he sent me so many pictures of his models to use that there was no way I was going to fit them all in that one article. Today I have a selection of those pictures for four of his Golden Demon winning models with never before seen in progress shots. The WIP pictures I received are what really enthralled me the most. It's not often you get to see how some of the top Golden Demon winners prepare and go about their models. I also got Todd to come back and give us a little bit of info in his own words about what went into making these award winning models. Enjoy! Todd: When the new Dark Eldar were released I had to have the Lelith Hesperax miniature. Almost immediately after opening the miniature I knew I wanted to convert her to a wood elf. There is actually a lot of conversion work here. The base is custom as well as the sprite, most of her hair, arms & weapon. Todd: I had a lot of fun working on the banner for this miniature. At the time I hadn't seen servo skulls carrying a banner and thought it would be a cool idea. 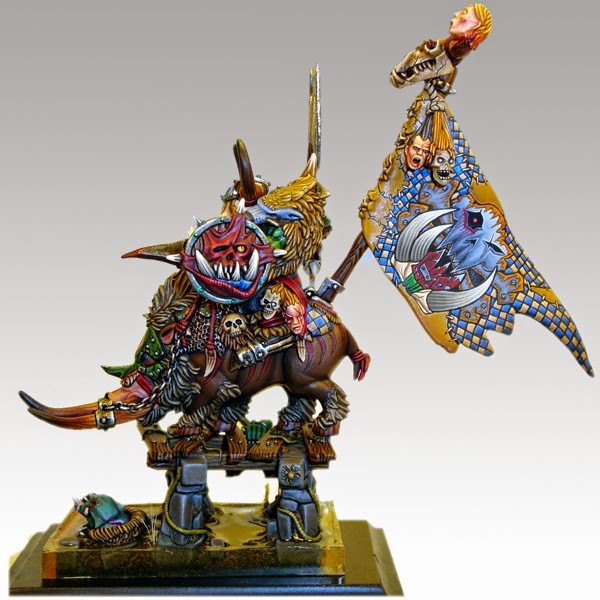 With Chaos I could have a little fun and have skulls from other races so I converted a Kroot & Ork Skull with a Nurgling riding it. I started this mini as a warm up piece for my Miniature Mentor video. I also used it as the demo piece for a class I taught at Baltimore GD 2009. It was never intended for competition but I kept adding to it and changing it over time. I entered it in the Crystal brush in April and then I Deremeled out the original face and put in a new one as well as sculpted the banner. Todd: This was my Slayer Sword Challenge entry from 2007. I really pushed myself with the base concept and sculpting on this one. This was a stressful fast paced project but I was really happy that I won the Slayer Sword Challenge that year. I didn’t have time to do all the things I wanted to do to the mini before the Slayer Sword Challenge deadline, so I added the banner and other items before I entered it in the Golden Demon. 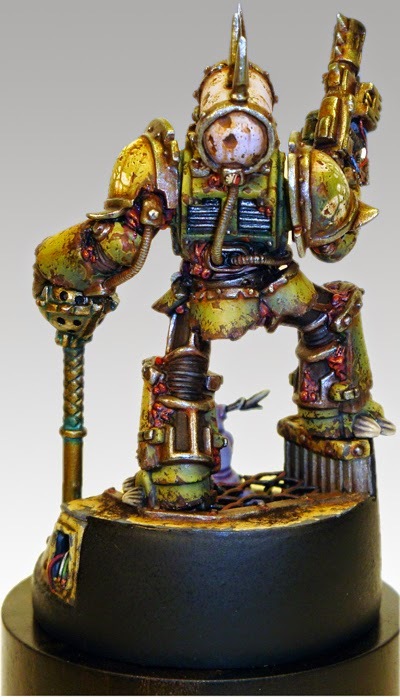 I did a lot of conversions on this mini including the base that is almost 100% scratch built. I spent close to 200 hours on the mini. Todd: This was my Slayer Sword Challenge entry from 2008. 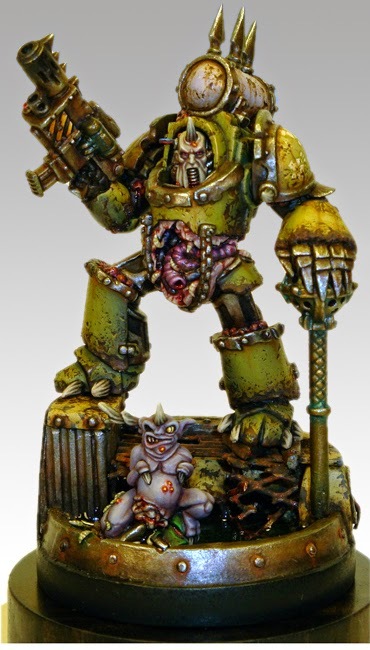 This was the first 40K miniature that I had painted to a competition standard. Before that I was strictly into fantasy miniatures. If the model had not been chosen for me for the Slayer Sword Challenge then I never would have painted it on my own. I don't know about you, but this stuff fascinates me. I might be able to get even more WIP pictures out of Todd, so maybe we can have a Part 2 to this with even more of his models.